Elex is the kind of weird, flawed RPG we don’t always get anymore. Inventive in some ways and stagnant in others, Elex will appeal to die-hard RPG fans and few others. What is it? A story-driven old school action RPG set in a modern open world. Billed as a science fantasy game, Elex is more like getting out every single toy in the drawer and playing with them at the same time. One figure is bigger than the other, one has a gun, another is a knight, another is a pirate. None of them quite fit together, and that means that sometimes the whole thing looks pretty odd, but for better or for worse we’re definitely using every single toy we’ve got. 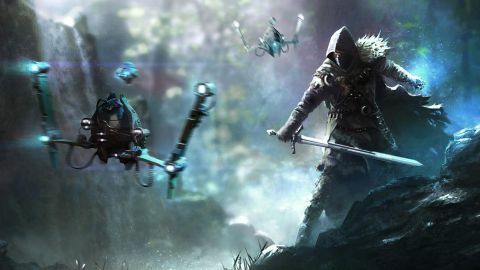 More an unapologetic genre mashup of post-apocalypse, fantasy, and sci-fi videogames than a straightforward science-fantasy game, Elex’s cobbled-together tropes and genres are an astonishingly apt metaphor for its cobbled-together systems and stories. After 54 hours with Elex, playing well into its endgame, I was still curious about its world and the things in it, but in the process I was so often frustrated with the actual play that I doubt I’ll go back for more. Individual animations are smooth, but they fit together very poorly, making action scenes look sloppy and indistinct. Frankly, it’s no worse than the much-loved PUBG, but since Elex lacks that game’s fast pace it’s much more noticeable. Characters are visually interesting and pretty well acted, but their writing and behaviors are wooden. In return for this lack of coordination and stiffness, Elex gives you an open world that’s both densely packed and easily traversable. What you can’t scale with a jerky climbing animation and a few jumps you can reach using your jetpack, allowing satisfying open world exploration where you can pick a point on the map and go straight to it, no matter the height you must climb to do so. Instead of the normal moral compass of good-bad that RPGs use, your character’s spectrum runs from cold and emotionless to passionate and explosive. On the world of Magalan, there are four kinds of people: People who think technology is Jesus, people who think technology is evil, people who are emotionless mutants, and people who want to get really wasted. To progress, you must join one of the groups of the Free People—technology loving Clerics, barbarian magic-using Berserkers, or drugs-and-explosives obsessed Outlaws. It’s a reductive, transparently gamey faction system that should be one of the worst things about the game, but actually fuels odd stories and endearing fish out of water interactions between characters. The main character in particular, once an emotionless Alb mutant but now betrayed by his people and without his powers, has had so little interaction with the real world that his behavior is an entertaining parody of stiff, boring scarred white guy videogame protagonists. The game plays into this, instead of the normal moral compass of good-bad that RPGs use, your character’s spectrum runs from cold and emotionless to passionate and explosive. Narrative design and storytelling in Elex suffers from a notable lack of uniqueness and variety. The companions, with one exception, are pretty much stock genre characters who lack interesting twists. Other characters in the world are white European (all of them) stock characters straight out of a fantasy or sci-fi archetype, and generally lack depth or motivations beyond their obvious immediate situation. The overall plot is pretty well executed, though somewhat disjointed in its end stages, and even though I found all the twists and turns predictable they were still a fun ride. The voice acting tries very hard despite the mediocre script, and in places—all comedic—rises above the limitations of a game of this scale. Every dramatic scene in the game falls completely flat. Elex’s primary conceit is that this world doesn't care about your character. It’s designed to appear as such using a variety of tricks that are standard to the open world RPG, like a day-night cycle that gives characters routines to follow. The most effective way that it communicates this independent nature is by a complete lack of scaling mechanisms. Enemies have the same stats from hour one on, meaning that much of the world at start—90% or more—is totally, brutally inaccessible to you on pain of death. Playing this game, even on its easiest difficulties, you will save constantly and re-load just as much. There are interesting social and dialogue choices that any given character might access because they only require you to have spent points in a specific category of skills. You might be able to intimidate a guard because you have a handful of points in combat skills, or repair a robot because you’ve sunk every point you have into crafting. Like anything else in the game, these requirements vary wildly—one of the first characters in the first town has a dialogue option that requires a whopping ten points in a skill category. Social options, then, seem designed for those who will play the game multiple times, consulting a wiki before opening any given conversation to ensure they’ve got the right skill totals to choose the dialogue options they want. You can stumble on some of the end-stage characters or set piece encounters of a quest before you even know it exists. Conversely, the openness of the world and quests can be great. You can stumble on some of the end-stage characters or set piece encounters of a quest before you even know it exists—like myself, who found a conspiracy in the making and was forced to deal with it before I knew most of the people and the situation involved. Sadly, though, this is the exception rather than the rule—it only happened to me a few times. In truth, though, most of Elex’s progression boils down to fights. It’s billed as an action RPG, and uses the common stamina system to limit attacks, but its play is much slower and more demanding than most modern interpretations of that genre. Attacks build up combo meter, which increases damage, with each progressive attack in a chain doing more damage. This makes it sound like it’s about knowing your weapon’s animation and timing, but you can’t rely on that at all. It’s more about knowing when to parry or dodge than anything else, but the interactions between animations and odd hitboxes mean you hit when you expected to miss and get hit when you know you pressed the button in time. Enemies have diverse and interesting designs, like giant fungal trolls, advanced combat robots, and Cronenberg-esque twisted mutants, but generally lack unique or creative behaviors and fall into a handful of clear types that use the same attacks. Many of the ranged weapons and magical powers are difficult-to-impossible to use—I became so frustrated with them early on that I picked up a club and shield and rarely looked back. Fights are at their strongest when they’re one on one against a powerful foe, but Elex throws you haphazardly into huge brawls instead of scaling up to harder opponents with more interesting attacks. Fighting these large numbers requires you to run around at full speed drinking potions between attacks, exploiting the world geometry to ensure you’re not hit in a kind of guerilla warfare with the game’s design. Exacerbating core gameplay problems are Elex’s opaque combat systems and rudimentary UI. Stats like “attack power” are mentioned by items but never defined or given a clear scale. You can’t see your character’s health total, just a bar that never changes size. You can’t even see how many experience points you need to level up, just a grey bar. As you level up, you quickly learn that your statistic points serve very little purpose other than to unlock the thresholds that allow you to wield new weapons and get new skills. It’s an illusion of strategy and complexity rather than actual depth. The majority of your ability to do anything actually comes from equipment, and each new piece of equipment has ever-higher requirements, this means progression comes in fits and starts that don’t align with gaining levels. A new weapon means the ability to fight enemies you could only tickle before despite nearly identical stats and skills. Ten hours and ten levels later little has changed—but then you upgrade your weapon and suddenly reach a new tier of power. Equipment and skill acquisition are terribly designed. Perhaps this wouldn’t be bad, but equipment and skill acquisition are terribly designed. They’re gated behind a crafting and training system that requires you to gather and spend money—money which is painfully difficult to gather. It’s not worth going into details, but you’ll be grinding kills and selling everything you find to get equipment in the late game. Beyond that, weapons have stat requirements, so if you’re not careful with timing your upgraded weapon you can be unable to wield it. The entire system is an insult to the player’s time and attention. The only thing that makes that grinding bearable is Elex’s world and area design, which is patently its greatest strength. It’s a lovely looking place, full of clearly hand-crafted corners. It emphasizes quality over size. (Though it is quite large.) Though building models are repeated I never noticed them in the same arrangement twice. Nooks and crannies contain items, enemies, and people. Almost always to kill, yes, but there’s enough competent environmental storytelling to keep you interested. A lot of effort went into the camps of bandits and raiders you find: A pack of cigarettes near where a guard was standing, or a toy secreted away beneath a bed. Much of this detail is never activated by the story or by quests, only by player driven exploration. I found new places and things, even characters and quests, hours into the post-game. Elex is an ambitious game. As with all open world RPGs, it’s riddled with odd little bugs, though I never encountered one that prevented me from finishing a quest or progressing the story. Otherwise, it ran remarkably smoothly, with very few hiccups other than texture pop and nary a dropped frame on a five year old machine. Elex’s flaws don’t really come from the bugs, but from how it falls short of its ambitions. Its world and visual design are top tier, and it’s a game with a wide scope and an eclectic vision—it's fun for the forgiving—but that ultimately leaves much of the game underdeveloped. Its RPG systems in particular, what it should rely on for a core, enjoyable gameplay loop, are lacking. Combat is difficult because of numbers, not because of gameplay. Building up a cool character isn’t about customization or uniqueness, it’s about putting in the time for new equipment. Those systems become the weak link that fails to hold the whole thing together.